A senior US envoy on North Korea will visit the Demilitarized Zone on Thursday to take a first-hand look at the country he's tasked with handling, diplomatic sources said. It was not immediately confirmed whether the envoy, Stephen Biegun, will meet with North Korean officials there. He is set to tour the truce village of Panmunjom along the inter-Korean border, also known as the Joint Security Area, a token of decades-long military tensions and on-and-off dialogue. The two Koreas have disarmed the JSA under a recent military accord. Biegun, the special representative for North Korea, traveled to Pyongyang in early October, together with Secretary of State Mike Pompeo. But he has yet to make an official debut in negotiations with North Korea. His dialogue counterpart is Vice Foreign Minister Choe Son-hui, according to Pompeo. 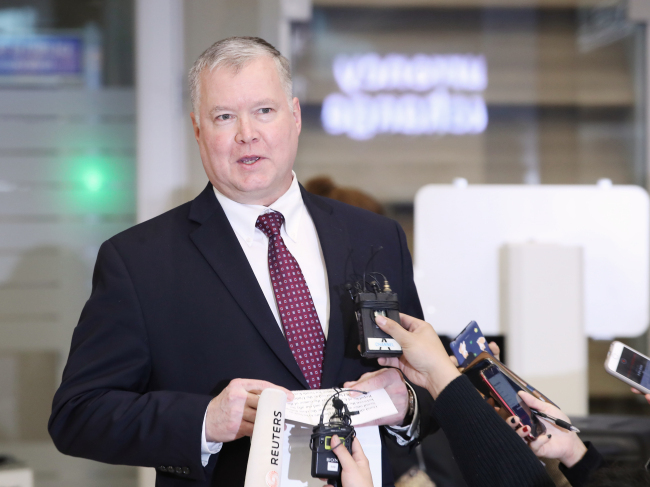 Biegun arrived in Seoul Wednesday for consultations with South Korea's top nuclear envoy, Lee Do-hoon. The two are scheduled to hold one-one-one talks later Thursday and meet again the next day in a "working group" session. Biegun's trip to Korea comes amid months of deadlock in denuclearization talks spurred by summit diplomacy. In a statement he read upon arrival at the airport, he presented an apparent carrot for Pyongyang. He said Washington is reviewing its policy on humanitarian assistance provided to North Korea by private and religious American organizations. "I will be sitting down with American aid groups early in the New Year to discuss how we can better ensure the delivery of appropriate assistance, particularly through the course of the coming winter," he said. He added, "We will also review American citizen travel to the DPRK for purposes of facilitating the delivery of aid and ensuring that monitoring in line with international standards can occur." The DPRK is the acronym for the North's official name, the Democratic People's Republic of Korea.